Saint Spyridon church is considered to be one the most important religious monument. According to the legend Saint Spyridon had saved four times the island of Corfu from the Ottoman invasion. The church is located close to Spianada and behind the famous Liston in the center of the old Corfu Town. Inside the church according to the locals there are the remains of the saint. His remains are carried around the town of Corfu in a very peaceful litany four times a year to celebrate his miracles. The church of Saint Spyridon was initially built in Sarocco square into the Corfu Town. However, in 1590 it was erected in its present location. 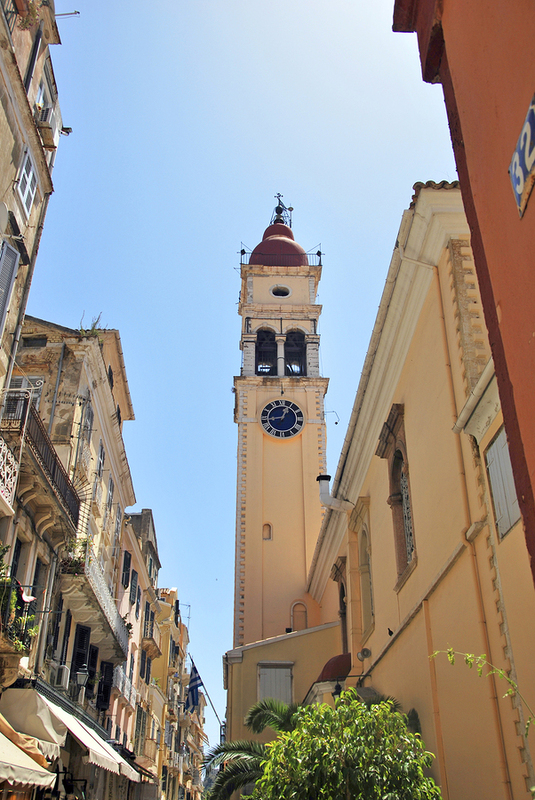 The church’s bell tower, which was built in 1620 and overlooks the old city of Corfu, is simple as it suits the plain external view of St. Spyridona church. The aspect that differs on St. Spyridona’s bell tower is the red dome in its finishing. Underneath the bell there is also a big clock with Latin numbers and gold pointers. The Saint’s holly remains, remained in Cyprus for about 300 years after his death, although at the end of the 7th century ac they were transported to Constantinople, because of the Arabian invasions against Cyprus. In 1456, three years after the fall of Constantinople from the Turks, the priest Grigorios Polyefktos took the Saint’s relic and brought it to Corfu. Corfu people honour the guardian saint with greatness, that is why Spyridon or Spyros are one of the most common names of people on the island. The church is always open for the visitors of Corfu island. Transfer Corfu organizing tours to Corfu town including always Saint Spyridona’s Church.